Still drops as of tonight on the Terris-Thule server. i bought it for like 2cp or something. not bad at all. i tried throwing this thing with my rouge yesterday and it said "you are to far away to hit your target" in red text. so i moved closer and closer until it said "you are too close to throw this item" in yellow text. i walked backwards and kept clicking the throw button and all i got was red and yellow text. i couldent throw this thing. it might have something to do with it tried throwing it at a player character on sullon OR it might have something to do with the fact i was in the paludal caverns. im not sure but i could throw this at all. also i dont think the range was 50. i think it was about 30 which means verant screwed with it. I had the same issue as well as a guildy. Used the range slot, created a key, but doesn't work like a bow. Any ideas? where does it say it only have 3 charges? YOU hit a SOANDSO for 2 points of damage! Uhm IMHO this syas charges unlimited which tells me that if you equip this in your range slot whatever is in your ammo slot becomes the wep that will proc disease but then again what di know? This item is a thrown item and has a small chance to proc when it hits the mob. It is NOT, I repeat, is NOT RIGHT-CLICKABLE. You throw it like a bomb and it hits the mob for a single digit amount of damage. The effect has like a 10% chance of going off, so you gotta throw 10 of these before you can expect it to work. Once you throw it, it's gone. Also this mob is extremely rare, so don't look for it without a Ranger, as the distance track is extremely useful in catching him. Actually, the janitor is not especially rare. Fighting on the ramp between the first and second floors, I see this guy about once an hour or so. I use the vile substances to spare my shurikens, which are difficult to replace when I'm far from the nearest monk guild. Worthless as weapons, but like shurikens, are more of a pulling tool then a weapon. The range on this is less than half of what a shuriken is, but I used this to pull a Pickclaw Destroyer who was so close to the Gorge zone that I couldn't get in melee range without zoning. This got him after mean. Never actually had one of these proc disease. It must be a rare proc. You must not miss the critter in order for it to proc. There is a similar item in Lake of Ill Omen off of Pond Sturgeons. Pond Sturgeon Spines proc Poison. This is not 100% but regular proc chance. Don't go farming these expecting to be Mr. Diseaseguy. However, if you like throwing nasty funk then be my guest. It procs when you throw it, it has one charge...as after its thrown, it is gone. Its NOT right clickable..you have to throw it and hit for it to proc.. These are neat! Disease grenades, basically. How undeniably fun. 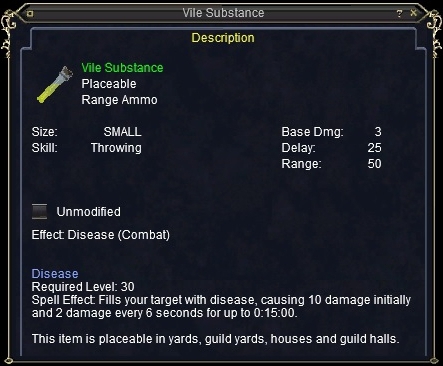 I hope more vial-of-stuff weapons are added. Where did the janitor get it, anyway? Just general cleanings-up? Fred Chook, usually a 40 Rogue on Fennin Ro. A rabid They Might Be Giants fan. Why would you need a stack? if it's clickable, then it's an unlimited charge item. There is no EXPENDABLE label on it...also, it doesn't show that there's any charges on it. Either it procs when thrown, or you can click it a million times, and it'll never go away. You need this for a second quest out of Paineel after recieving the Leggings of Riddosan for the Cold Iron quest. You 2 of these and a slime from the bottom of the Greenblood river and a unknown 'substance of an experimental nature' which is from a side quest in Freeport Necro guild. The side quest and the final quest itself is currently unsolved on the Rodcet Nife sever. BTW. the quest yeilds yet more armor of Riddosan which is ERU/SK only. lvl 22 SK of Cazic-Thule. This would seem to fall in-line with what is happening in the Karanas with the plaque. Is the Goblin Janitor new? I haven't been to RE too much, but in the times I have been there I have never seen him. My gut feeling is that this is for the dynamic quest that is happening, much like the Bandit Runners in QH dropping the clay and stuff a few months back. Unfortunately, it's a proc (at least it probably is) and so you'd need several in order to get it to go off. If this were stackable, it might be worthwhile for rogues... but... it still seems lame.